Are you living in Europe and looking for looking for country specific news in English? Take a break from the BBC, CNN and so on and check out some great websites! 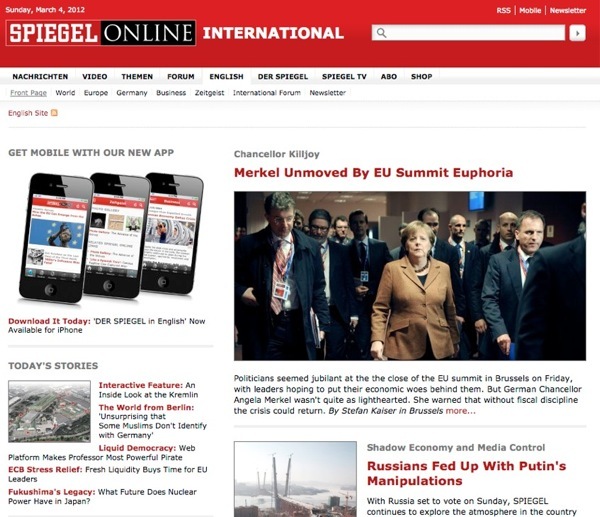 Austrian Times is a great source of Austrian news in English, along with the more targeted (although less regularly updated) Vienna Times and Salzburg Times. This franchise also has Croatian and Romanian news in English. In Sweden, The Local exists to keep you up to date on Swedish news – well newsish … if you are looking for detailed articles on what is happening politically in Sweden, perhaps this is not the place to go, however, if you want to be up to date on what ridiculous things Swedish elks have been caught doing this week, you are in luck! Just steer clear of the comments section, lest you loose hope for the future of humanity. The Local also has English news for France, Switzerland, Germany and Norway as well. I have to say the German version seems to be a cut above the rest with quite a few very interesting, well research articles. Their forum Toytown Germany is also a great source of information for anyone living in Germany or who is planning on moving there. Speaking of brilliant English news resources in Germany, you really can’t beat The Spiegel‘s international section. I am endlessly impressed by the quality of the articles they have on offer there, not only relating to Germany, but also Europe as a whole. The coverage of the Eurocrisis (as much as I hate the term and carry on) has been brilliant. I really hope the Spiegel’s precedent starts a trend of English/international sections in quality non-English newspapers. It is so important for English speakers to expose themselves to the point of view of other countries, something I think we need to do a bit more of especially when the large majority of English speakers are not multilingual. For Spanish news in English, the Olive Press claims to be number 1 and seems to be regularly updated. Corriere Della Sera offers Italian news in English. PressEurop translates articles from a selection of European newspapers in Spain, Greece, The Czech Republic and Romania, France, the UK, Germany, Serbia and Luxembourg into into English, German, French, Spanish, Romanian, Italian, Portuguese, Dutch, Polish and Czech each day. For more French news in English, check out The Connexion and France 24. In a completely different league, try the English edition of the beautifully written publication Le Monde diplomatique. While it is not just focused on France, it is still well worth reading. For brilliant, in depth essays on Europe related cultural topics, check out Eurozine. This is more in keeping with an academic journal than a newspaper, and offers translations in a variety of languages. Swiss news can be found here and here. The aptly named Baltic Times covers news from Latvia, Estonia and Lithuania. For more Greek news, have a look at Athens News, which seems to be filled with quite comprehensive, well written articles. For Dutch news in English, check out these websites: here, here and here. For a Hague specific newspaper, check out this website. The best place for Icelandic news is the Facebook group for The Iceland Weather Report. Also visit her blog, although it is no longer being updated, Alda provided a fascinating (and tireless) coverage of the Icelandic financial crisis as it happened, not to mention an entertaining commentary on Iceland and Icelandic people. And if you want to laugh, check out Iceland’s twitter account, their website, Icelandwantstobeyourfriend is also hilariously cute. Takk Takk did a very good job of re-inventing Iceland’s image, I think! Living in Denmark? Don’t feel left out, Politiken offers excellent coverage of Danish and world news. Searching for some Finnish news? You are in luck! Helsinki Times has Finnish news in English, as does Helsingin Sanomat. The Warsaw Voice offers Polish news in English. The Slovak Spectator has Slovakian news in English. It seems irregularly updated. Looking for Russian news? Try The Moscow Times and The St. Petersburg Times. The bonus of most of these news sites is that they also have a listing of English speaking jobs in whichever country they cover. Do you know of any news sites in English that I have missed? Let me know!